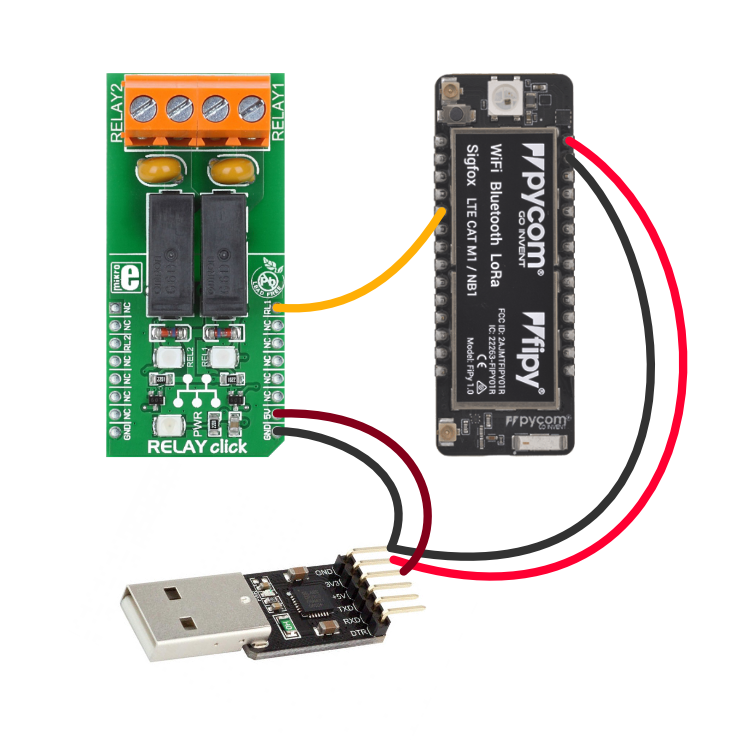 Control the state of a lamp remotely through a mobile app or web app by using Pycom's FiPy, MikroE's Relay click and WolkAbout IoT Platform. Pycom boards offer an easy way to make the Internet of Things applications using various networks (WiFi, Bluetooth, LTE, LoRa, and Sigfox) through the code written in MicroPython. For this purpose, WolkAbout made WolkConnect-MicroPython, a library that is responsible for all the communication with WolkAbout IoT Platform through a simple and easy to use API. To showcase our library, we've put together a little project to enable remote control over a small LED lamp in our office. We used Pycom's FiPy board, but the code should seamlessly run on Pycom's other boards as well. However, there may be some differences regarding what pins should be used on different boards, so please refer to your board's pinout diagram. Before beginning, make sure that your board is programmed correctly by getting the latest firmware and that you have the Pymakr plugin installed in Atom or in VS Code. Apart from Pymakr, we've found that you can also use ampy to check how your code runs on the board, and mpfshell to manage files on your board and enter REPL mode as well. For any additional information, visit Pycom's docs page. So what needs to be done? You need to clone WolkConnect-MicroPython in order to have access to the wolk.py module, which you will need to copy onto the board later. You will also need to copy Pycom's implementation of an MQTT client that is a dependency for WolkConnect-MicroPython and can be found here: mqtt.py. There is also a copy of this module in the attachments under the same name. Besides those two modules, there are only two additional files: boot.py - first script to be run on the device that will set up the board, and main.py - where the actual control over the LED lamp will take place. Both of these files can be found in the attachments of this post. and entering the credentials you get from WolkAbout IoT Platform when creating a device. To get these credentials, you need to create a device first by using a device template. The device template for this project, "Smart light-deviceTemplate.json", is available in the attachments, so create a copy of it. Log in to or create your account on WolkAbout IoT Platform and navigate to the Devices section. Select the Device templates tab, and then click the + button, and select the Upload option navigating to your local copy of the device template. Now that a device template is available, you can create a device from it by clicking Create device. The following form has the Smart light device template pre-selected, so simply click Next step. Here, you need to give your device a name and select the checkbox for Create semantic group for this device (this is necessary for creating widgets on your dashboard later on). Additionally, enter the reference used for the Switch actuator of our device. and these are all the changes that need to be made to the project. After connecting the board to your PC, you will need to get the name of the port. On Linux, you can run dmesg | grep tty and on Windows go to Device Manager and find the name listed under Ports. You will need this to set up your Pymakr project or for connecting with mpfshell. If you use the Pymakr plugin, create a directory, open it as a project in Atom or VS Code and then copy boot.py and main.py into this directory. Make a directory named lib and then copy wolk.py and mqtt.py to it. Now you can synchronise the project by pressing the Sync icon from the console. Using mpfshell, copying files can be done by navigating to a local folder that contains all the necessary files and running mpfshell -c "open ttyUSB0"
Once that all the files are in place you can enter REPL mode by entering repl. Now you can perform a soft-reboot of the device by pressing CTRL+D (exit REPL mode with CTRL+] ). The board will run boot.py that will start main.py and duplicate its output to the terminal so you can make sure that the device can connect to the WiFi network. At this point, the onboard LED should glow a faint red, signalling that the light switch is in the off state. Select Actuators then select Switch from your device and click Save. Now, if your board is powered on, you should see the current of the switch and you can change its state by toggling the switch on or off. The device will receive the command and toggle the switch on. That’s it! You managed to gain remote control over a light switch from the web and even from your mobile device (Android or iOS). Your lights are now IoT-enabled. This script will connect to your preferred WiFI network and then connect to WolkAbout IoT Platform to send the current state of the Relay click that it has set to off state when booting up. It will then check for incoming actuations of the Relay click from WolkAbout IoT Platform every 20 milliseconds and change the state if a command has been received. Other than that, it will publish a ping message once every minute to keep the connection alive. This is a device template that should be imported on WolkAbout IoT Platform in order to be able to create a device. With WolkAbout IoT Platform, we give you proven technology to develop powerful IoT applications and control your business ecosystem.